Every person has two sides: a good side and a bad side. The person you perceive as unethical and self-absorbed could be an ardent animal lover. The pretty lady you saw on the street today could turn out to be an arrogant b*tch. And if we acknowledge a person's bad side, we should also acknowledge the person's good side. Otherwise we're no different from the person we hate, merely a bunch of biased pricks. And that's the one thing I dislike about those political Facebook pages. Very often we see the admins of those pages post biased reports that glorify whatever that has been done by one party while undermining and even humiliating the efforts of other parties. These so-called fighters claim to be fighting for the people, though in fact they only shower their praise on one particular party while excoriate the others. Whatever the other party does will get its share of criticism no matter how perfect it seems to be. Neutral? I don't think so. Fighting for the people naturally means whatever that benefits the people has full support from the admins, regardless of the nature of the party involved. 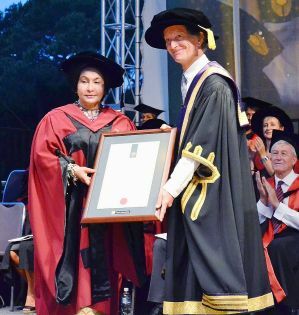 But very often that doesn't seem to be the case with the wife of the Prime Minister, Datin (DR) Rosmah Mansor. Control your urge to swear and read on. 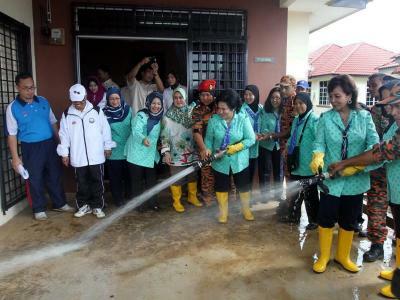 She visited the flood area in Kuala Terengganu yesterday and gave out the RM 500 aid to the flood victims. She was present in the Girl Guides uniform and helped out with the cleaning. So why criticize her even when she's doing something good for the people? At least she's out there helping out the flood victims while her critics remained in front of their computers. Don't get me wrong, I do not like her at all. It sickens me to see her antics on the news. But that doesn't mean that I criticize whatever good things she does for the people. And before you go on saying how much money she has absorbed into her own pocket, let me remind you not to stray from the focus of this story, which is the fact that she has visited the flood victims and you (and most probably those facebook admins) have not. This mentality is akin to some incompetent teachers who will forever brand a particular student as stupid no matter how much the student eventually improves. It's that branding fair for the student? No. And is the action of those Facebook admins fair for Datin Rosmah? I'll leave that to you to decide. Of course we cannot judge a person's personality based on single act of kindness. We all know about her 24-million-ringgit-diamond and all the undeserving accolades awarded to her. But hey, let's give credit where it's due eh?